According to Polish builder Mateusz Waldowski, the Newag 15D/16D is a broad-guauge diesel locomotive that’s a heavily modernized Polish version of the Soviet-era TEM2. 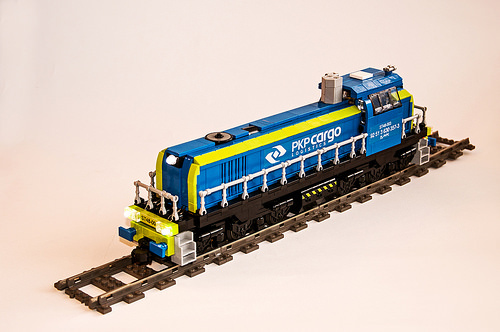 With excellent color blocking and a couple of custom stickers, Mateusz has built a stunning LEGO version in PKP Cargo livery. I especially like Mateusz’s use of corner panels for the steps, and the angled cab windows. See more photos of Mateusz’s locomotive in his album on Flickr.